ENG. MRS. OKUPEVI OLAIDE MARY – ASSISTANT DIRECTOR, COMPUTER ENGINEER & HEAD INFORMATION COMMUNICATION UNIT. Engineer Mrs. Okupevi Olaide Mary was born March 5th 1971 at Ikeja in Ikeja Local Government area of Lagos State. She attended Ajara Grammar School Badagry for her Secondary School Education between 1983 and 1888. She later proceeded to Lagos State University and read Computer/Electronics Engineering between 1990 and 1996. Okupevi joined the Lagos State Civil Service as a Computer Engineer in March 2000. She worked as a Computer Engineer Officer in the Ministry of Science and Technology between 2000 and 2009. She was redeployed on the 9th of February to the Ministry of Works & Infrastructure (Office of Works) as Head, ICT Unit, Ministry of Housing in January 30th, 2012 and to Tourism, Arts and Culture on the 13th February, 2017. She is a member of the Nigerian Society of Engineers (NCE) and Council for the Regulation of Engineering in Nigeria (COREN). 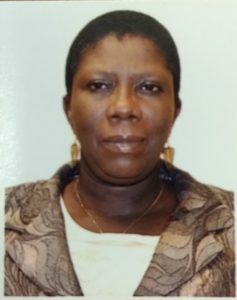 Previous MRS. OLAJUYIN OLUWAYEMI TITILOLA – ASSISTANT CHIEF AUDITOR AND HEAD OF AUDIT UNIT. Next BARRISTER OWOEBUTE- OKEDEJI – ASSISTANT DIRECTOR AND HEAD OF LEGAL UNIT.